On November 1, 2014, residents of Asheville, N.C., awoke to a chilly surprise: snow. For most folks in town, the Saturday snowfall was an opportunity to sleep late and recover from some Halloween revelry the night before. But for about 200 hardier souls, it was race day. The weather conditions were just another obstacle these runners would need to overcome in climbing 3,000 feet up a narrow, rugged 18-mile trail. When the starting gun sounded, more than a few runners let rip whoops of joy: They were looking forward to what lay ahead. Welcome to the Shut In Ridge Trail Run. The origins of the Shut In date back to December 13, 1980, when some 64 intrepid men and women assembled to clamor over rocks, roots, and fallen leaves as they followed the trail of the same name originally blazed by George Vanderbilt that led from his home, Biltmore, to his hunting lodge up on Mount Pisgah. Runners have continued that tradition now for 35 years, making Shut In one of the oldest continuous-running races in the region. It’s also one of the most mysterious. People tend to learn about the race purely by word of mouth. Capped at 225 runners, Shut In has a sniff of exclusivity to it. Registration filled up in just four days in 2014, which is saying something because would-be runners need to fill in applications by hand and snail-mail them in, along with a check and a self-addressed envelope. 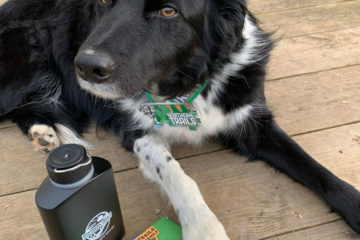 Bibs are then awarded on a first-come, first-serve basis (though return runners are given priority), and lucky runners are notified by mail if they made the cut. There’s also the perception that completing the race is something like undertaking a Herculean task. If you’re at a craft brewery in the Asheville area and share the news that you ran Shut In, well, you’re pretty much guaranteed to impress even non-runners in earshot. Tim Epley, the former girl’s basketball coach at TC Roberson high school, was the one who originally dreamed up the idea of racing up Vanderbilt’s mountain path. Back in the late 1970s, Epley worked for the National Park Service as part of its Youth Conservation Corps, which put students to work during the summer building and restoring trails. 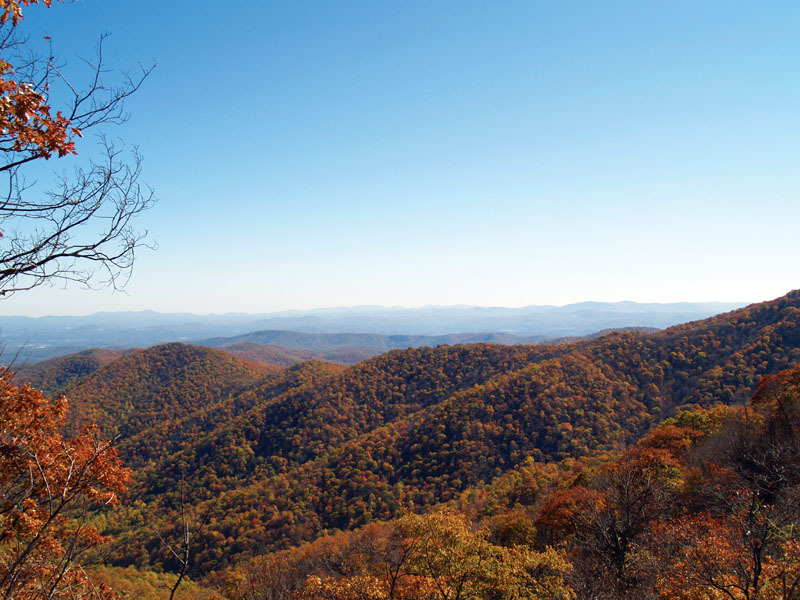 After the Blue Ridge Parkway was built, park rangers were interested in adding trails that hikers could access via the new scenic byway. Epley’s crew’s job was to restore the Shut In Trail, which was named for the abundant rhododendron and mountain laurel shrubs that encase many sections of the trail. 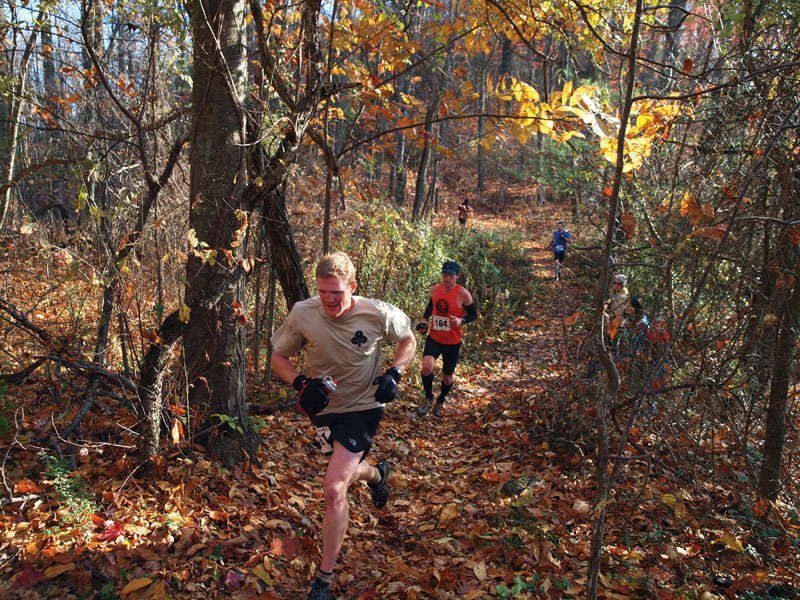 Runners climb steadily higher as the course hugs the ridgelines, doing their best to hop over sole-stabbing rocks and to maintain their balance as they skid over fallen leaves. Runners also crisscross the parkway several times, where they can meet up with support crews and enjoy spectacular vistas. While there are dips and downhills here and there, especially a steep spiraling descent that follows the apex of Ferrin Knob, which stands at 4,010 feet high, runners find the air becomes steadily thinner as they make their way up to the finish line at the base of Mount Pisgah, which sits at a cool 5,000 feet. Aside from knee scrapes, twisted ankles, and a few cases of mild hypothermia, Shut In runners over the years have avoided any major injuries. That fact speaks to both the kinds of runners the race attracts and the preparation they put into getting ready to tackle it. Shut In runners also need to beat two time cut-offs along the route or face getting their race number pulled. “We can’t stop someone from running,” says Blair, “but we also don’t want to be waiting until midnight for someone to finish.” Blair says race organizers have also pulled runners off the trail over the years if they looked dazed or disoriented. That combination of accessibility combined with a challenge helps explain why Shut In lures runners of all kinds who seek to push themselves to beyond their normal limits. One of the race’s distinctive characteristics is the fact that so many people run it more than once. David Culp, for example, ran it 15 times—including once, in 1985, when he also served as race director. No one has run every race over the years—though a few have come close. R.C. Cutler holds the distinction of running the first 25 iterations of the race—a streak he began at the age of 46. Others like Garry Sherman, 64; Keith Wood, 65; and Jim Clabuesch, 49, have all run it more than 20 times. The race has seen plenty of repeat champions as well, such as Adam Pinkston, Shiloh Meilke, and Jay Curwen. Curwen, now 48, first ran the course in 1984 as a seventeen-year-old high schooler, when he finished in 19th place. He would eventually win the race four times. Meilke ran his first Shut In in 2004, finishing 13th, before winning the race each of the next five years. His sister, Meadow Tarves, has also run the race several times—and won the women’s division in 2006, placing 11th overall. Then there’s Pinkston, who ran the race eight times, winning seven of them, including in 1984 when he ran with legendary speed and style: His fellow runners all but gawked at his punk-rock-style pink Mohawk as he sped away from them up the trail at a record-setting pace. But the current record holder for most Shut-In finishes is Chris Campbell, 50, who, if all goes well, will toe the starting line for his 30th stab at the Shut In in 2015. 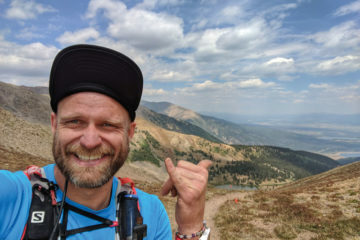 Campbell, who makes the 6.5-hour trek down from his home in Virginia to run Shut In, says he never intended to run the race as many times as he has. But it’s become something of a holiday for him, like Thanksgiving or Christmas, an event he looks forward to all year long. “It’s a chance to see if I’m still up for the challenge,” says Campbell. Campbell drove down to Asheville to run his first Shut In in 1984 while a student at Virginia Tech and a member of its track team. Campbell felt strong throughout his first crack at the race. He trailed only the leader, Pinkston, until he hit a pivotal point in the course some 15.5 miles in that begins after runners cross Route 151. That’s where the trail climbs some 1,000 feet of elevation over two miles at a 20 percent grade to finish up at the base of Mount Pisgah. Indeed, that final climb up to Mount Pisgah, which is as challenging mentally as it is physically, has always played a key role in the finish to the race. “I’ve won the race walking those final two miles and I have been beaten running them,” says Jay Curwen. While Campbell never won Shut In—he’s finished in the top 20 18 times—he came close in 1990. He remembers feeling strong as he crossed Route 151 and attacked the final climb like he never had before. Then, as he came around the last turn, which is actually part of a short but seriously steep descent toward the end, he looked up to see Roland Randall crossing the finish line. What he didn’t see, however, was that a new set of steps had been built into the hill. He instantly tripped and literally somersaulted across the finish line three seconds later, capping off the closest finish in Shut In history. Shut In runners have faced rain, sleet, and plenty of snow over the years. But the race was cut short only once, in 1991, thanks to a blizzard that blew some two feet of snow into the mountains—forcing Jim Curwen (Jay’s dad), the race director that year, to pull runners off the course after just 13 miles at the Stony Bald Overlook. “You could say I had the fastest winning time in Shut In history,” says Jay Curwen, who hit the overlook in 1:28:14. Last year, with the entire parkway closed due to the snow and ice encrusting it, race director Norman Blair had every reason to postpone the race. But this was Shut In. So Blair made the decision to press on with the race, only with a wrinkle: once runners reached Route 151, they would head downhill from there for four miles, for a total of about 20 miles, rather than finishing up on Mount Pisgah at the traditional 17.8 mile marker. While the downhill miles on the pavement were icy and steep—punishing the quads of the 184 runners who completed the race—it was still easier than finishing the traditional two-mile uphill climb, says Campbell. “We were lucky we got the race in at all,” he says. Over the years, the course route has actually seen some changes, which has created something of a debate around who owns the most impressive time among Shut In winners. 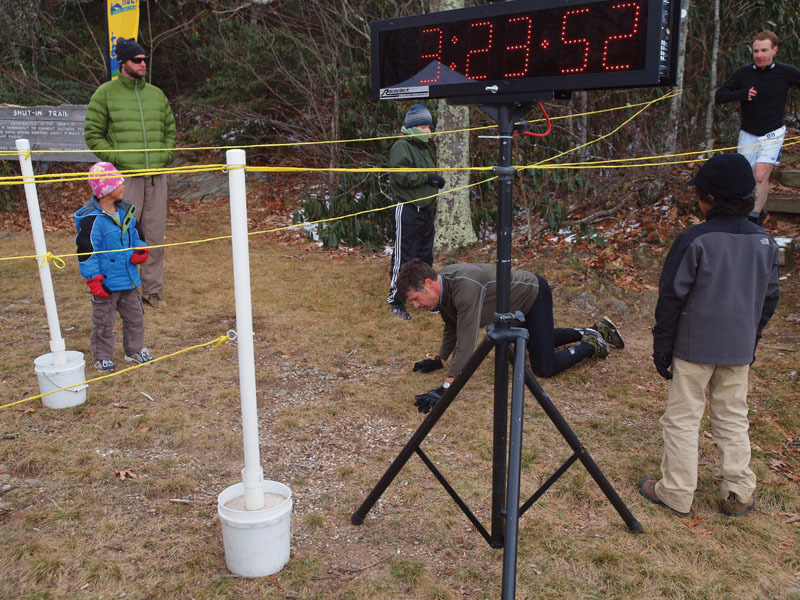 Is it Adam Pinkston’s time of 2:11:35 on the original course, which was shorter but also trickier than today’s course? Or is it Shiloh Meilke’s time of 2:16:55 on the current and longer course, which he set in 2006? Aptly enough, Pinkston held the record on the newer route until Meilke first broke it in 2005—while sporting a pink Mohawk like Pinkston had in his own record-breaking run some twenty years earlier. If there is a word that best describes Shut In it might be “tradition.” For as much as Asheville has changed over the past 35 years, so much of Shut In has stayed the same. The top finishers each year receive stained-glass trophies similar to those that were handed out back in 1980. As a nod to history, and unlike just about every other race out there, only those who finish the race receive (cotton) long-sleeve t-shirts. And there’s that archaic registration system—something Norman Blair admits he gets complaints about. Another thing that won’t change about Shut In is the size of the field—which will always be limited due to the permits issued by the parkway and forest services. That means that, as long as the permits get issued, running the Shut In each year will remain a special and unique accomplishment.